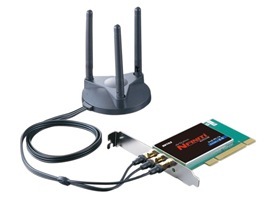 Buffalo Nﬁniti Wireless Desktop PCI Adapter is designed to stream High-Deﬁnition (HD) video, voice and music. With faster wireless data rates and more coverage than legacy 802.11 products, Buffalo Nﬁniti Wireless solutions provide sufﬁcient bandwidth, range and reliability to deliver multimedia ﬁles to any room in your room. Enjoy the freedom of high-speed media streaming!